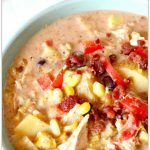 This creamy corn chowder recipe is filled with sweet corn, potatoes, chicken, black beans, salsa and cream cheese. This particular chowder recipe has lots of mild Mexican flavors and is family friendly. Add ingredients into the pot. Turn your Instant Pot to the saute setting so that it can start heating up and come to pressure quicker. Add in the chicken broth, chicken, corn, green chiles, beans, 1/2 cup picante sauce, 1 1/2 Tbsp taco seasoning, salt and pepper. Stir. Cut the potatoes and just add them to the top of the soup, don’t stir in, just let them sit on top. Pressure cook. Turn off the saute setting. Cover the pot and secure the lid. Make sure valve is set to sealing. Set the soup button to 10 minutes (or if you don’t have a soup button use the manual/pressure cook button and set it to 10 minutes). Pressure release. Let the pressure release naturally for 5-10 minutes and then move the valve to venting. Shred chicken. Add in the cream cheese (it will melt in a couple minutes) and the bell pepper. Remove the chicken with tongs and shred* on a cutting board. Add the shredded chicken back into the pot. Stir in the remaining 1/2 cup of picante sauce and 1 1/2 Tbsp of taco seasoning. Thicken soup. If you want a thicker chowder turn your Instant Pot to the saute setting. Combine the cold water and cornstarch together in a small bowl. Mix until smooth. Stir the mixture into the pot. Let the soup thicken, it should just take a couple minutes. Serve. Salt and pepper to taste. Ladle into bowls and top with desired toppings. Enjoy!